There has been much discussion in the Toyota Forums about the difficulty in finding attractive, yet functional mud flaps for the front of the vehicle. Mud flaps or running boards are absolutely necessary if you have the larger 31" wheels; otherwise, the sides of the vehicle will be sandblasted in short order. What you see on my 4Runner is actually two flaps in a layered fashion. I got the idea after seeing a couple of factory designs that have a very similar appearance AND not being able to find anything that would fit my 2000 4Runner that I ordered with no running boards. The photos show the solution I came up with to, 1) provide a mounting system independent of the relatively weak outer sheet metal and flares, 2) be large enough to protect the vehicle sides, and lastly, 3) provide an attractive appearance. The mud flap mount to the right was hand formed out of 1/8" steel plate. The inner two bolts (furthermost in) provide the major support and strength. The lower bolt passes through heavy bracket that mates up to one of the running board mounts and the upper bolt uses an existing hole that was available at an upper body pinch seam joint. 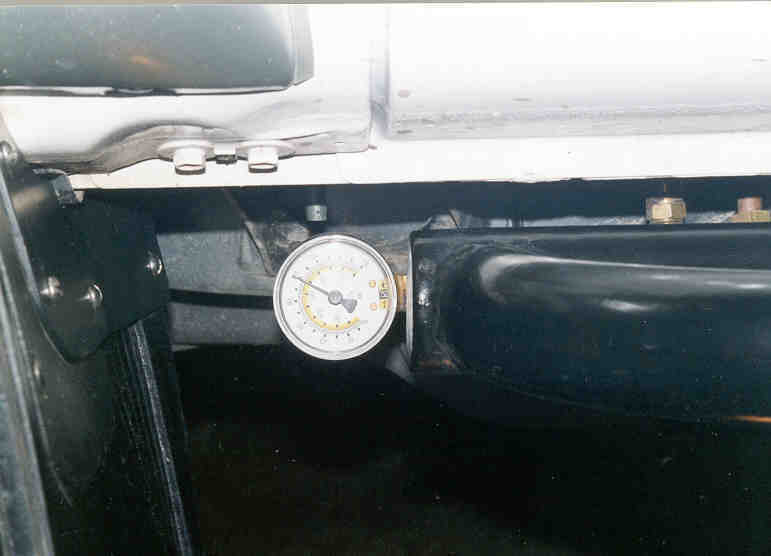 The outer two smaller bolts use existing flare mounting points (which are not very strong) to provide clamping force for the upper "cosmetic flap" (with the neat Toyota emblem). 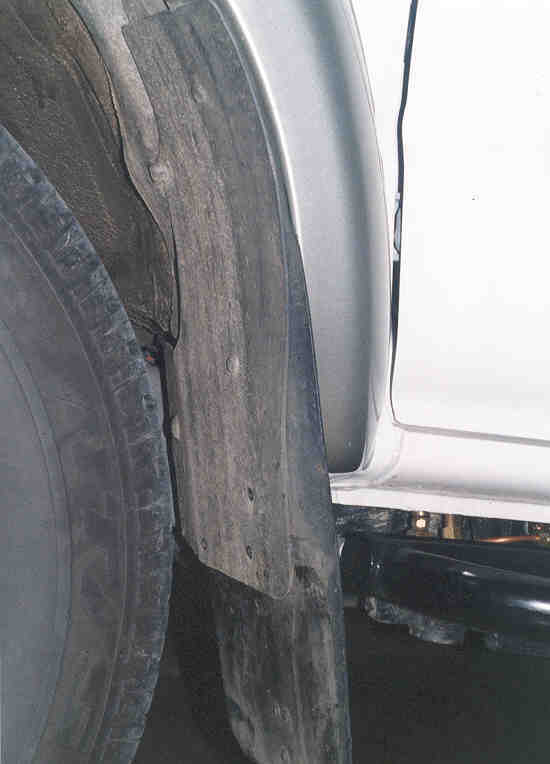 You will note that on the inner part of the mount, there's a bend away from the direction of the tire toward the body. This is critical in providing sufficient clearance under max left turn, max articulation situations. The are 4 additional holes visible that are used to mount the lower, larger flap which provides the real protection. 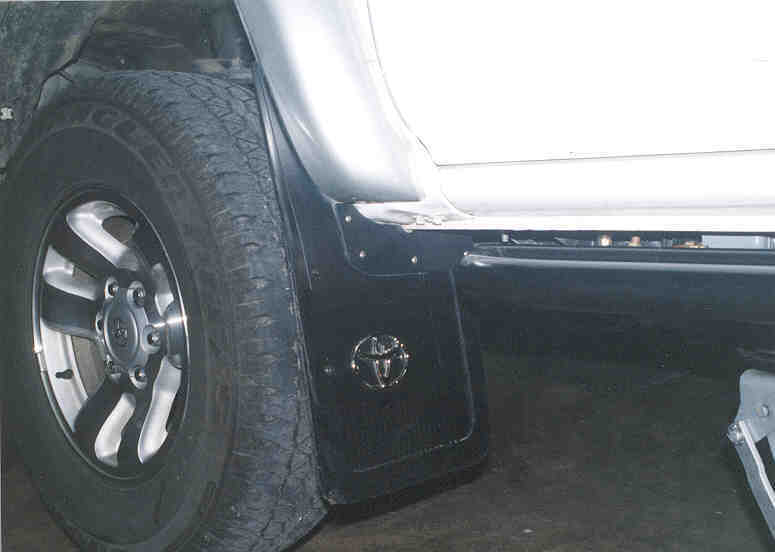 On a 4Runner with 31" tires and no lift, the flaps need to come down to 5" from the pavement surface, to prevent rocks from hitting the rocker panel or painted wheel flare areas just in front of the rear wheel well. Shown to the left on the back side of the mounting plate is the companion plate that with the 4 stainless bolts, clamps everything together. The plate was shaped to replicate some of the style lines embossed in the upper plastic flap.